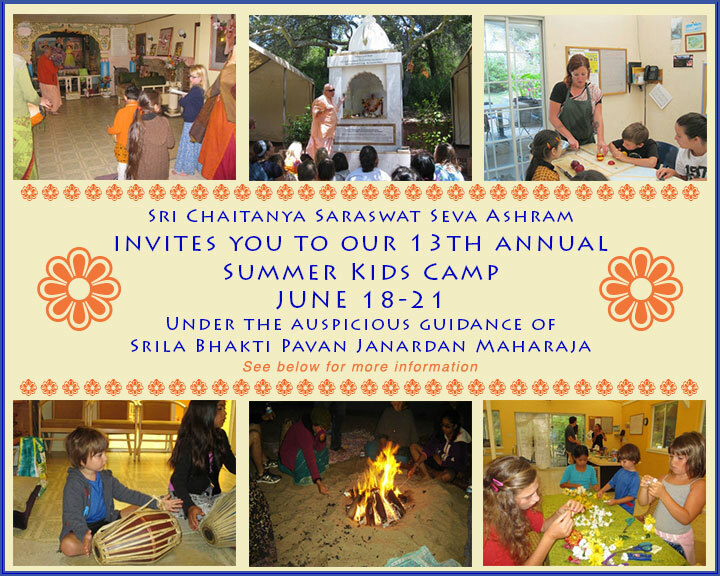 The Sri Chaitanya Saraswat Seva Ashram’s 13th annual Children’s Summer Camp is here. It will begin Thursday, June 18th and go until Sunday, June 21st. Under the auspicious guidance of Srila Bhakti Pavan Janardan Maharaj we humbly invite you and your family to attend this spiritual and fun filled event. This year’s camp leaders are Radhika and Sada Sundari Devi Dasis. A disciple of Srila Bhakti Sundar Govinda Maharaj, Radhika has been involved at the Seva Ashram since she was a child. She now has her Master’s in Education and may be found at the temple every Sunday cooking for the Sunday feast. The children and adults who attended her last Children’s Summer Camp said it was the most fun they ever had. Sada Sundari Devi Dasi has been here at the Seva Ashram for just over a year. She is a disciple of Srila Bhakti Pavan Janardan Maharaj. She brings lots of joy and enthusiasm to whatever service she engages in. She loves to work with children. 2) From the drop down menu choose other and type in camp. 3) You may also give your donation on the first day of camp. A sliding scale is available–just let us know. Camping is available and encouraged. Please bring your own tent, bedding and a flashlight. A few beds in the women’s or men’s quarters are available primarily for adults. Contact KrsnaPriya Devi Dasi at kpdd8@yahoo.com to reserve a bed. For information, to sign-up or to volunteer please e-mail Radhika Devi Dasi at radhikirk@yahoo.com or call 831-566-5419. Please let her know of your participation by June 5, 2015 so we can co-ordinate classes and meals accordingly. Don’t have kids? Please join in for the day anyway. Lots of service is available and help is always needed and appreciated. A schedule will be posted once we have an idea of how many children are participating. We look forward to seeing you and your family here at the Seva Ashram Children’s Summer Camp 2015.